Who says millennials aren’t voting? Polls say that young people aren’t engaged in the 2016 election. These students say the polls don’t tell the whole story. According to a recent NBC/Wall Street Journal poll, younger people are disengaged, disheartened and distancing themselves from the 2016 political process. Only 54 percent of respondents under 35 indicated they were highly interested in this year’s campaign. But don’t tell that to the students at MSU Denver. This sentiment is borne out by data, too: In a 2015 Tufts University analysis on higher education voting trends, nearly 70 percent of MSU Denver students were registered to vote and more than 92 percent of those who were registered cast their ballot. With voting rates 16 points higher than comparable institutions, it’s clear that Roadrunners value civic engagement. Milewski says that by directly engaging in dialogue younger voters become informed members of the electorate, and that gives voice to their lived experiences as students. That might mean the veteran taking advantage of GI benefits, a first-generation student as an educational trailblazer, the student working three jobs to support their family – or often some combination of the above. It should be no surprise then that SGA actively reflects a commitment to open dialogue in its election cycle programming. 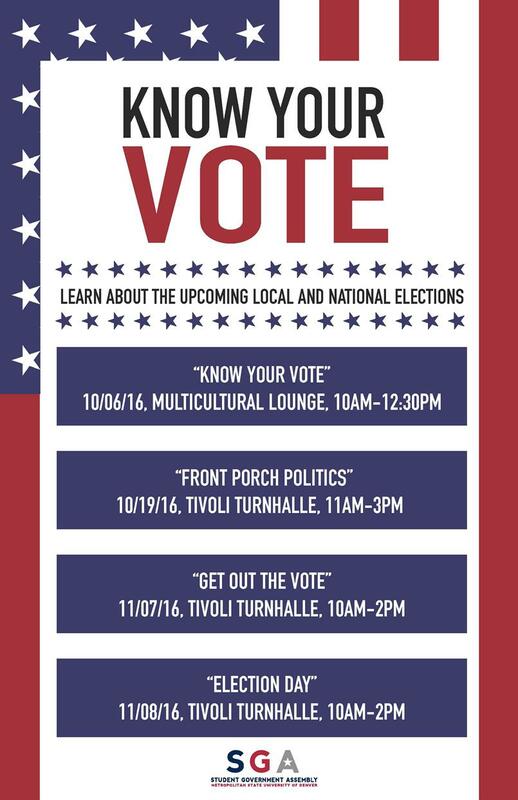 The organization is hosting a series of election-related events and initiatives that culminate on Nov. 8. A recent example is a joint effort between SGA and the American Democracy Project to help prospective voters register, confirm their status and identify their polling location. The ADP is an initiative of the American Association of State Colleges & Universities to inform and engage students. MSU Denver student Lily’Okalani Hafoka staffed a table during the drive. Representing the Zeta Pi Chapter of Delta Sigma Theta Sorority, Inc., Hafoka saw both interest and further opportunity for her fellow students to become civically engaged this election season. “People have been more involved thanks to the presidential race, but there are other issues that are equally as important,” she said. Ballot issues took center stage at an Oct. 19 event called Front Porch Politics. The gathering was put together by ADP and SGA, and featured debates around Amendments 69 and 70, which involve the creation of a statewide universal health care system and raising the minimum wage to $12, respectively. Bethany Fleck Dillen, associate professor in MSU Denver’s Psychology Department and committee chair for ADP, sees the informational dialectic as a natural outgrowth of the University’s mission. Political science senior Cesiah Guadarrama is an example of the process in action. Initially divided on the minimum wage issue, she was convinced through the debate that the measure would assist working families. Conversely, the conversation on the health care amendment raised more questions for her than it answered. According to Guadarrama, civic engagement begins with this research. When she hears people say they don’t know about the issues, so don’t plan to vote, she encourages them to start asking how it connects to their lives. Part of that is shifting the conversation from the need to feel like the expert to the desire to learn more. And once someone is armed with information, it becomes their responsibility to register and participate in the democratic process.